Calahorra - located on a promontory overlooking the fertile plain of Cidacos, the town's chief activity is distributing the area's excellent garden produce. 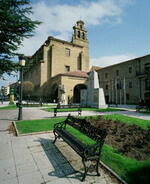 Worth visiting in the historic centre of Calahorra are the Gothic style Cathedral. In the Muslim old town there is a Roman arch and the church of San Andrés, from the 16th century. 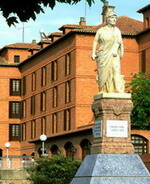 In Plaza del Raso, a former Roman forum, stands the church of Santiago, the finest example of La Rioja's Neoclassic style. The Parador, built using red bricks, strikes a wonderful contrast with the clear waters of the river Ebro and the Cidacos Valley. The garden, thick with vegetation and full of flowers and palm trees, is part of one of the most important historical and artistic buildings in La Rioja. The ancient Calagurris is of roman origin, and its cathedral is its most famous building. The building's features include huge doorways, windows and blinds with smooth interior lines and obvious medieval decorative influences. The conference suites are spacious with modern and functional facilities. The Riojan cuisine is based on the quality of the ingredients produced in the region. Its specialities include, vegetable stew, pochas (haricot bean stew), lamb chops with peppers, and pears or peaches cooked in wine. Santo Domingo de la Calzada - 46 kms from Logrono, Santo Domingo de la Calzada was a stopping point for pilgrims on their way to Santiago de Compostela. The Romanesque/Gothic Cathedral (1180) in the city occupies the site of an earlier church built by Santo Domingo. The free-standing Baroque tower was built in 1767, the doorway in 1769. The high altar has a magnificent retablo by Dami Án Forment. To the right of the altar is a Gothic baldachin over the 12th century tomb of Santo Domingo. The Parador is in a 12th century former hospital next to the Cathedral, built by Saint Domingo to house the pilgrims on St. James' way. Regal and elegant in style, it has majestic lounges and a vestibule full of gothic arches and coffered ceilings. Noble materials and bright colours – blue and white – lead on to comfortable, tastefully decorated rooms, some with canopied beds. These warm, harmonious surroundings are also suitable for social events and gatherings. The local red peppers must be sampled, especially if they are stuffed, whether with black pudding or other foods. The mixed vegetable platters are a famous product of this excellent farming region. And naturally, everything is accompanied by the exquisite wines of La Rioja. The spa of Arnedillo (110 kms) is known for the healing qualities of its water. 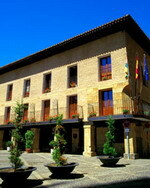 The Parador is in the convent of San Francisco, 800 metres from the historic centre of Santo Domingo de la Calzada. After the restoration of the buildings, the former guest house will be used, of considerable cultural value and the ideal base for nature rambles. Clients will be attended to in the various departments by students of the León school who will be putting into practice the skills acquired in the theory and practical classes of the Parador Training Centre, "Hostal San Marcos" in León, under our specialists and professionals. The restaurant offers the local Piquillo peppers, roast ribs of lamb from the Cameros mountains, mixed Ribera vegetables, cod Rioja style, Santo Domingo cake and the famous Rioja wines with Denomination of Origin.